Games are known for their constant shift. More so than nearly any other art form, games are on a rapid track of evolution and change–constantly finding new ways of challenging and innovating not only their individual titles, but the medium itself. Games are often built directly around one of these innovations–a fact that can make some games breathtaking and unique while others are merely gimmicky. In my recent review of The Walking Dead: Season 2, Episode 1, I applauded Telltale Games for seeing fit to avoid reinventing the wheel when it came time to continue this franchise. They took what worked in their previous season and added more of their amazing writing to keep something bold and engaging alive. I said this because The Walking Dead has already figured out what works for it–it knows why we play, and if it can keep us guessing without destroying the carefully planned framework they already have going, then we can expect years and years of entertaining terror from them. On the other hand, when a game studio can work an unusual and challenging gameplay into the fabric of their game’s storyline, then we’ve got something truly special. 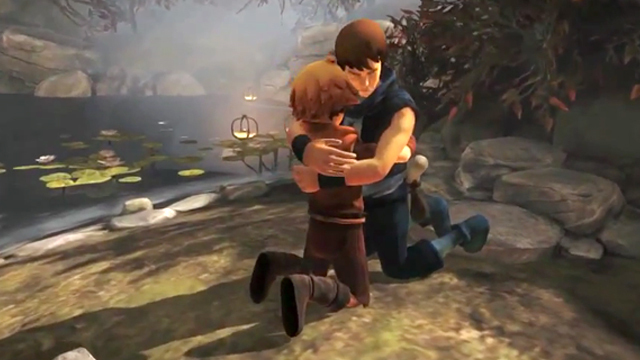 I’m talking, of course, about Brothers: A Tale Of Two Sons. Developed by Swedish game developer Starbreeze Studios, Brothers is a sublime blend of unique gameplay and emotional investment that only comes from the most memorable stories. It somehow rides a perfect balance of childhood bedtime fable and melancholy dirge of woe as you simultaneously guide two brothers through a breathtaking and terrifying landscape. The first thing you notice about the gameplay is the very act of moving both brothers at once. In Brothers, you will utilize both thumbsticks–each for one character. This is an important skill to get used to, as the harmony with which you can command these two has everything to do with completing the game. One boy hoists the other over his head–the smaller one climbs through cage bars that are too tight for his older brother. This new way of playing is challenging without being terribly difficult, and has an uncanny ability to insert the player into the story itself. The player’s learning curve makes the danger and wonder that these brothers feel at the prospect of such a grand adventure all the more real. Their fears and frustrations are that much more relatable–you’re more engaged in the story–almost as if you belong there. Complementing this intriguing gameplay is a gorgeously rendered Alpine world, set high in a range of mysterious mountains. The setting and its residents are true classic fairy tale creations. Strategic benches actually dot the countryside, as if the developers wanted to brag about how gorgeous their graphics were with momentary opportunities to take it all in. As you traverse the sometimes grim, sometimes glorious countryside, you get a sense of being a minor cog in something endlessly bigger than yourself (sometimes more literally than you’d initially expect). This only further accentuates the gorgeous landscape surrounding you–the same one that shines on beautifully as the world comes tumbling apart. One need only play Brothers: A Tale Of Two Sons for fifteen minutes or so to feel the undercurrent of something sinister in the air. And as the autumn gold gives way to blood-painted snow, the already tragic nature of the task forced upon our protagonists gives way to deeper pain, betrayal, and fear. Because Starbreeze Studios has integrated their unique control scheme so thoroughly with their intense landscape and characters, this is one of the first examples I have ever seen of the gameplay itself telling the story. Later, when a change in the gameplay is forced upon you, you feel vulnerable–you feel weak. As you relearn what you thought you already knew, the old mechanic feels like a phantom limb: just out of reach for the scratching. This fact ensures that Brothers: A Tale Of Two Sons is one of 2013’s most memorable games, and definitely one of the most creative. Though the game is a tad on the shorter side, it’s well worth the ride–and you’ll definitely get some replay value out of it, if only to revisit the unique shimmer that this world effortlessly dances in front of you. Even the achievements serve to further engage the player in the world itself, and collecting each one is an exercise in wrapping yourself up in game. I came to this one a little late in the year, but better late than never. Brothers is absolutely a must-own for fans of art within in their video games, and I’ll wager you find it on many “Best of 2013” lists. Your heart is warmed and then broken. Youthful hijinks morph into stomach-knotting fear. Brothers: A Tale Of Two Sons is grimmest beauty. It is sun shining on a funeral–hope and sadness mixed effortlessly. And I loved every minute of it.